Missouri Grass Fed Beef is committed to treating its animals humanely and ethically and to using sustainable, organic farming practices. 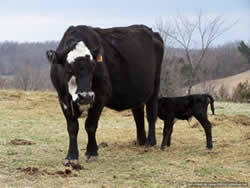 Raised in this natural environment, our animals are healthy. Our animals live low stress lives out in the pasture, eating their natural diets of various grasses and other forage plants. Low-stressed animals are healthier animals. Feedlot cattle spend their days in overcrowded, stressful confinement, standing in their own manure and eating unnatural diets of corn that is hard to digest and makes them sick. Because of these conditions, antibiotics and other drugs are necessary. Additionally, to raise the cattle in these feedlots quickly, the animals are given growth hormones and steroids. While grass-fed beef grows more slowly than corn-fed beef, we are proud to raise our animals in the natural way without antibiotics, steroids, or growth hormones. Raised in this natural environment with a natural diet, there is rarely a need for antibiotics or other drugs. If a calf ever does get sick, we do treat the animal accordingly and try to save it, but we then sell it to a commercial firm. Unlike grass-fed conditions, feedlot conditions are ripe with illness. Because feedlot animals are routinely given low-levels of antibiotics, some of which are the same ones used in human medicine, this overuse of medications is creating new bacteria-resistant strains. When humans become infected with these new, disease-resistant bacteria, there are fewer medications available to treat people. Some of our latest deadly diseases, like SARS, are a result of these factory farms because in crowded conditions, disease spreads quickly. Also, in large factory farms, disease is much more likely to jump from animals to humans. Since Missouri Grass Fed Beef raises its animals in low-stress, uncrowded, healthy environments, there is a significantly lower risk for diseases for animals and people, including E. coli infections.